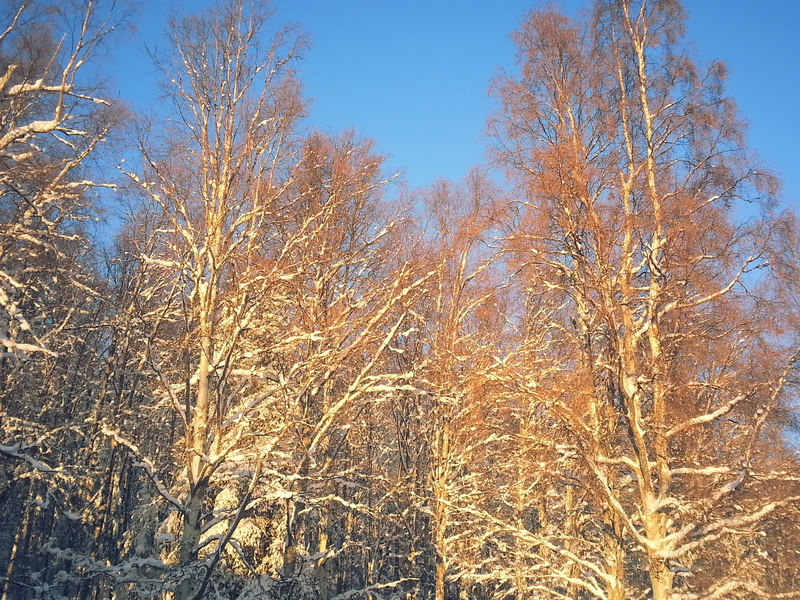 It’s well into winter up here now, the boats are flipped and life revolves around stoking the fire. The fishing is on hold for us at the moment, that is until the lakes freeze and then you might catch us out there enjoying the company of a few friends over a few holes drilled in the ice. 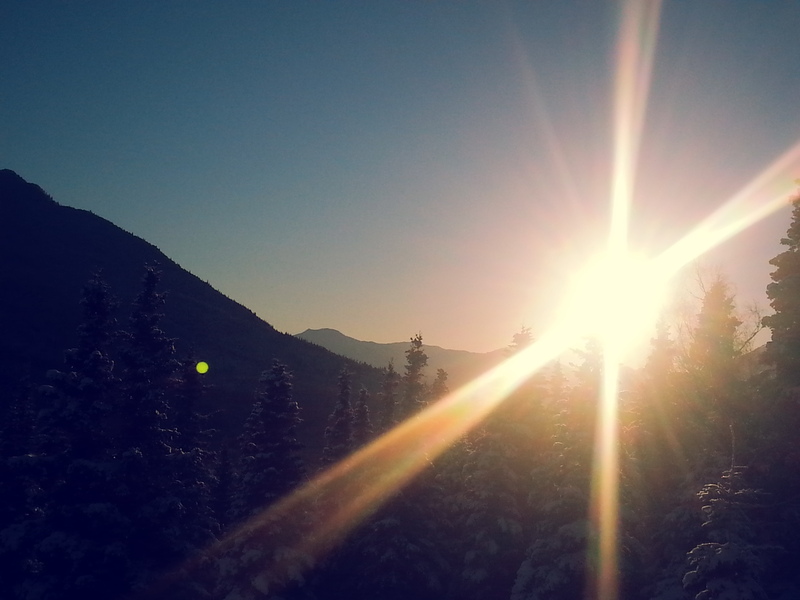 But for now it’s a time to settle in and enjoy the slow relaxing days of winter around the great state of Alaska, and specifically our beautiful home of Cooper Landing. 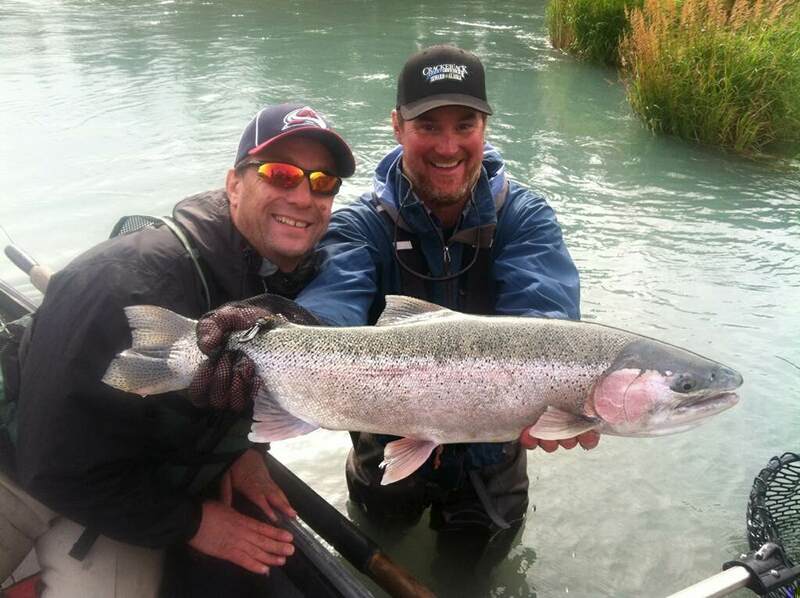 Also a time to catch up and share some great times had over the last summer out on the Kenai River. Families are gathering and we just want to take a moment to wish everyone a great holiday season!!! Thank you to everyone who came up this summer and enjoyed the river/fishing with us! It was a wonderful season and we all had a great time with returning clients as well as new that we had the pleasure of meet! 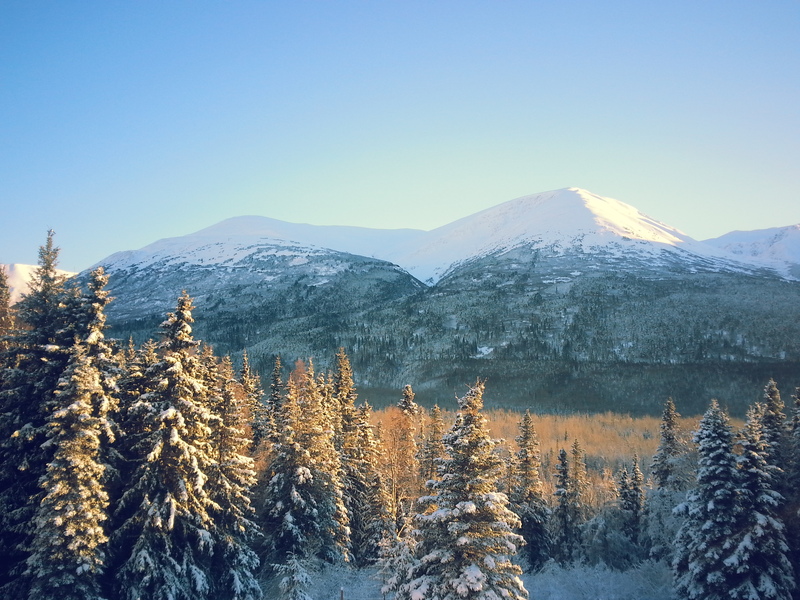 It’s never too early to start planning a trip to our neck of the woods so please enjoy the pictures and if your travels are going to bring you to Alaska this summer we are happy to answer any questions you may have regarding our great state! And last but certainly not least, this fall brought a keeper. 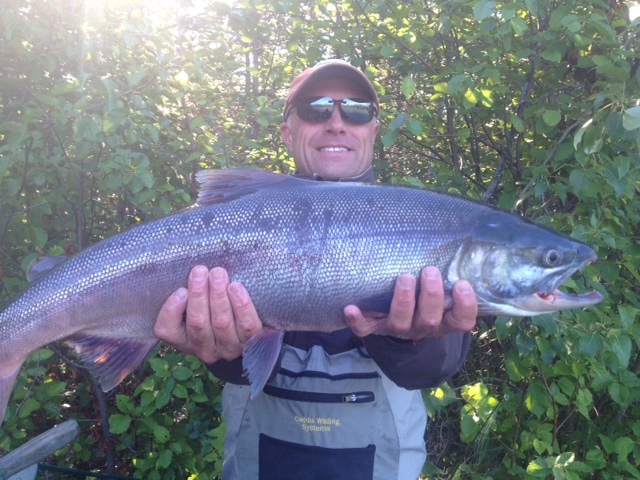 The newest guide of Kenai River Fly Fishing; Bayne Harpe. 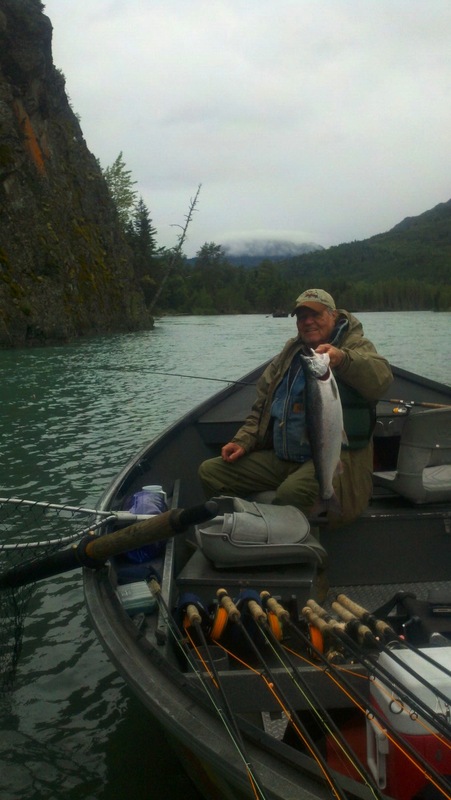 This entry was posted in River Report and tagged Alaska, Cooper Landing, Dolly Varden, Fish, fishing, fishing guides, Fly fishing, Kenai Peninsula, kenai river, rainbow trout fishing, Sockeye Salmon on December 23, 2013 by jenharpe. What can we say, it’s fall, the colors are quickly changing, it’s beautiful out and the fish, they are treating us well! Even though we saw quite a bit of rain come in the last week and we were approaching flood levels again, the fishing has continued to be productive all the way through. We saw the upper/upper turn off a little for a day or two but the Refuge and Canyon have been holding tough for us. There is still a considerable amount of water in the Middle and the Lower but with temps in the low 40’s at night and the termination of the rain we have already seen the peak and we are seeing the water levels dropping quickly. As per what we hope to see, the Rainbow Trout and Dollie Varden fishing has been amazing. It’s certainly the time to be out there and we can only hope that it continues if not improves! Okay, that was just greedy. Long time client Earl finally earns his big fish!! Guess patience is a virtue. Nice work buddy! 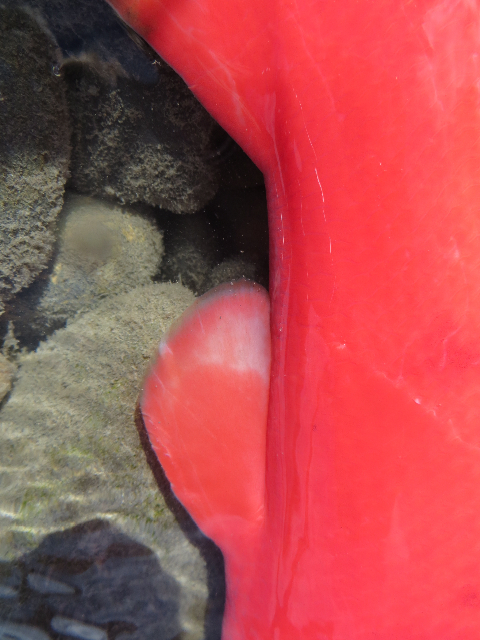 The usual bag o’ tricks is working, we are seeing the sockeye and the Kings in their spawn so cater to that. That being said, you find some time on your hands in the quickly lengthening Alaskan evening, might want to put some time into tying up a few extra leaders because you are bound to loose your share out there. Please feel free to give us a call if you need a water level report. She’s a powerful river that Kenai and we’ve seen a lot of people in some risky situations this year. We are happy to give you an update and talk to you about what is happening down here. Stay safe out there and have a great time! 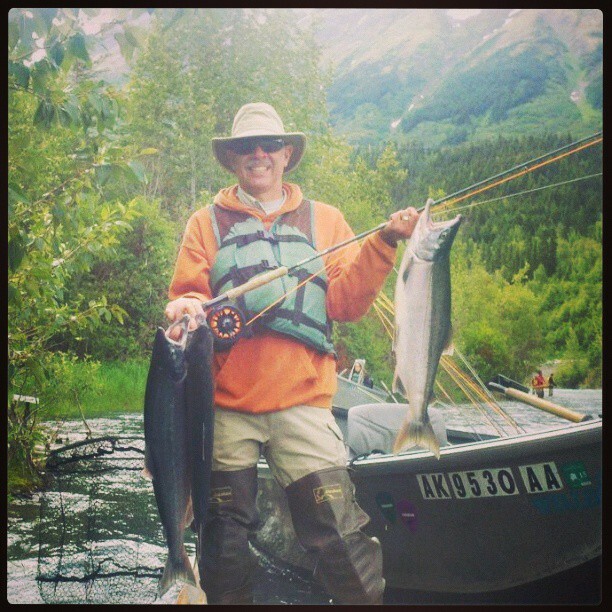 This entry was posted in River Report and tagged Alaska, Canyon, Dolly Varden, Fish, Fly fishing, Kenai National Wildlife Refuge Canyon, kenai river, rainbow trout, Refuge, upper kenai on September 15, 2013 by jenharpe. What can we say, it’s that time! 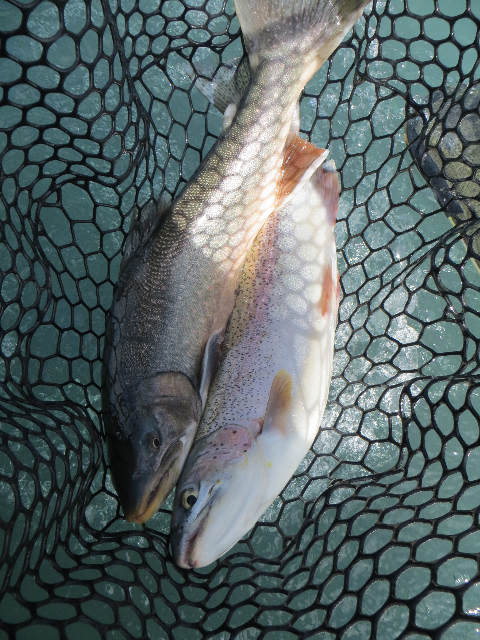 Trout fishing is game on, the weather is finally giving us a break and we are seeing Silvers in the Upper as well. This is what we have all been waiting for, the glory days of fall. We are all busy out on the river and loving every minute of it! Great day at the office. 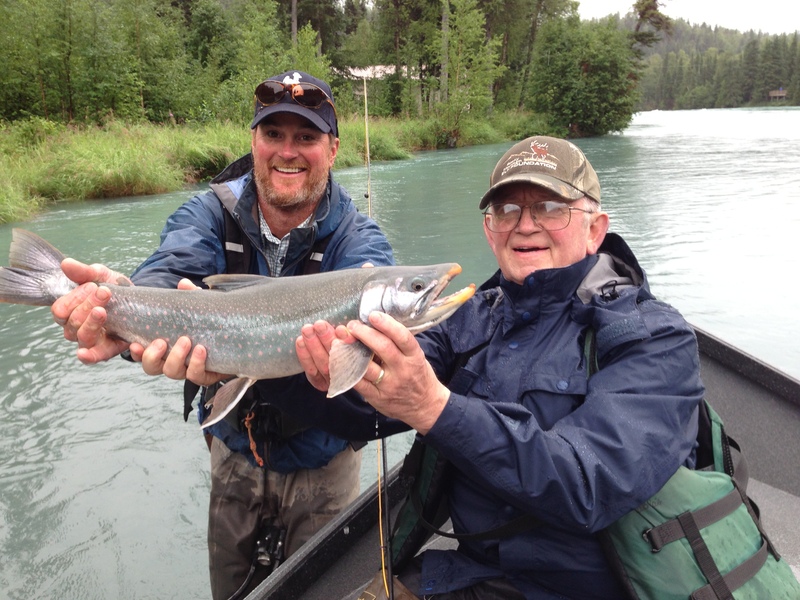 Guide Mike Harpe with a happy client and his Silver caught on the fly. 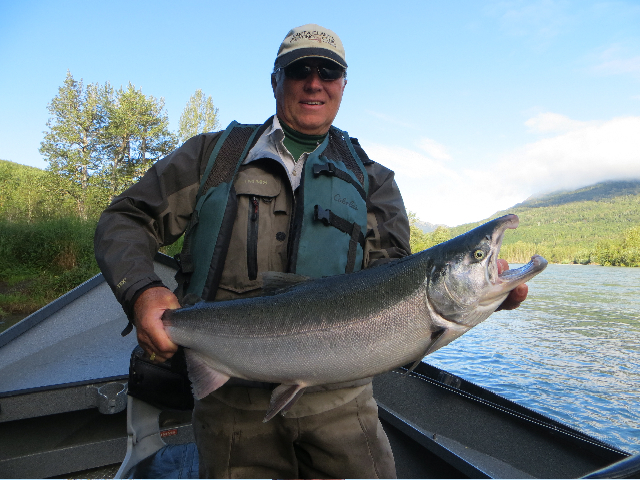 This entry was posted in River Report and tagged catch and release, Coho salmon, Cooper Landing, Dolly Varden, Fly fishing, Kenai, Kenai National Wildlife Refuge Canyon, rainbow trout fishing, Silver Salmon, Trout, trout fishing on August 23, 2013 by jenharpe. The crowds have wained, it was hard to believe it was Saturday at Sportsman’s Boat Launch today. The Salmon madness has come to an abrupt stop, the weather has been kind, and it’s an all around nice time to be on the water. We’ve been seeing some great dry fly hatches going on as well as the usual flesh and beads have been working their magic for fly fishing for both Rainbow Trout and Dolly Varden. The small creeks are a great alternative for some wade fishing as well. 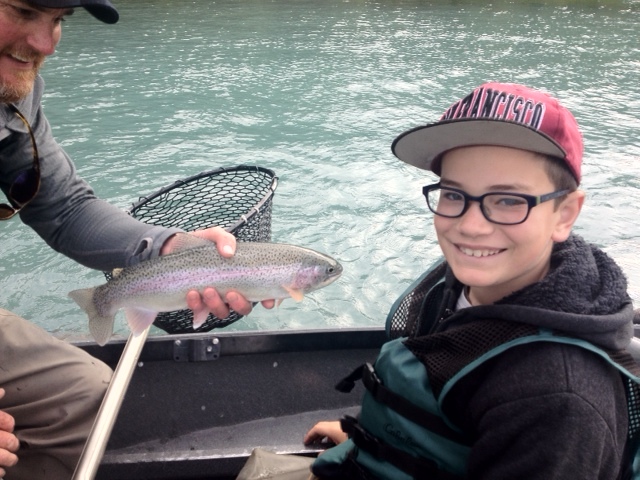 Out on the big river it is quickly becoming everyones favorite time of year to be out fishing for the Trout and Dollies and right now on the Upper Kenai there are also a sprinkle of Silver Salmon starting to show in the eddies. If this is your main target it sounds like below Skilak as well as going out on the salt out of Seward is the way to go. It’s fall, it’s time to sit back and relax and take your time out there. 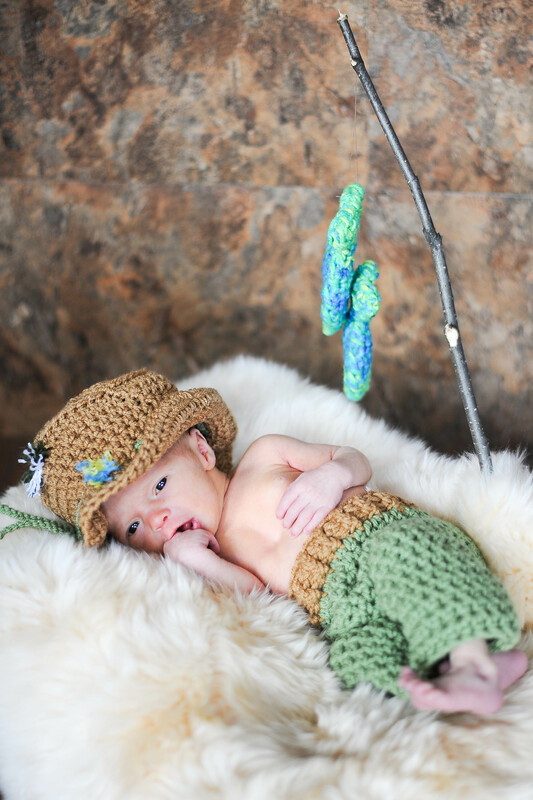 Happy fishing! Tony and his son enjoyed a day together out on the water. 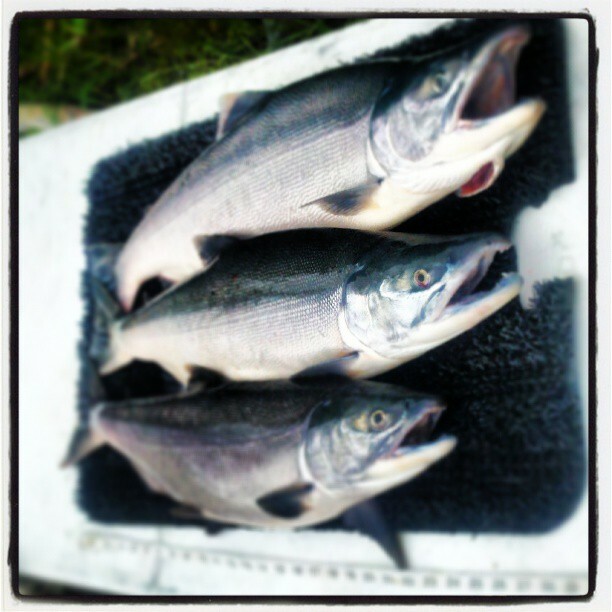 This entry was posted in River Report and tagged Coho salmon, Dolly Varden, Fish, rainbow trout, Salmon, Trout, upper kenai on August 17, 2013 by jenharpe. As it turns out it’s August! We’ve all made it through another big July push and the weather makes it feel like fall is breathing down our necks. With that being said, bring on the Trout fishing!!! We are still seeing a surprising strong run of Sockeye coming up the river and though you may need to be patient and pick and choose which ones you are keeping, it’s still been worth the time and effort to be out there. 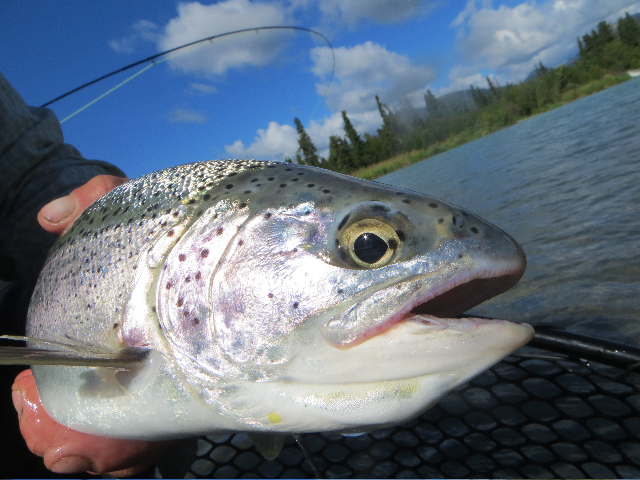 There are still quite a few chromers in the Upper Kenai River. We are currently up to 1,339,876 second run Sockeye in the drainage and are seeing a pretty consistent ~ 8-9,000 nosing up daily. The Rainbow Trout and Dolly Varden fishing has been picking up nicely as they set up waiting for the Sockeye spawn to turn on. We’ve had some amazing days out on the water lately fishing a “mixed bag” of both Sockeye and Rainbow Trout/Dolly Varden. It’s a nice time to be out on the water with the number of people slowing down, you can feel the ease of fall setting in. 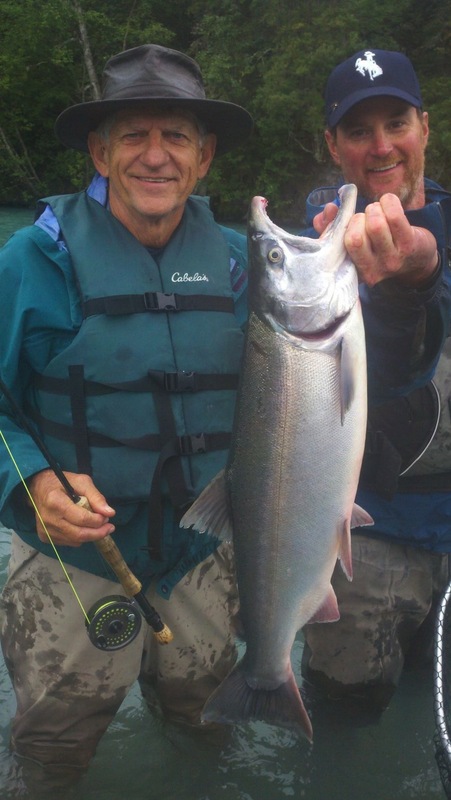 This entry was posted in River Report and tagged Alaska, Cooper Landing, Dolly Varden, fishing, fishing season, Fly fishing, kenai river, Professional Guide, rainbow trout, rainbow trout fishing, Salmon, Sockeye Salmon, upper kenai on August 6, 2013 by jenharpe. The second run of Sockeye Salmon are now in numbers of over a million strong in the Kenai River. If fresh Alaskan Salmon is something that you’ve been craving, now is the time to get out there after it. The run is already making a huge push up into the drainage and pushing towards those spawning ground, word is the large majority has already moved up past the lower Kenai. We are seeing the masses coming into the Middle and the Upper Kenai. Cooper Landing is the place to be right now between the beautiful scenery surrounding you, the gorgeous weather Alaska has been kind enough to offer this summer and the plentiful supply of Sockeye that we are seeing up here. It’s a great time to come out and play! Oh what a hard day of work! 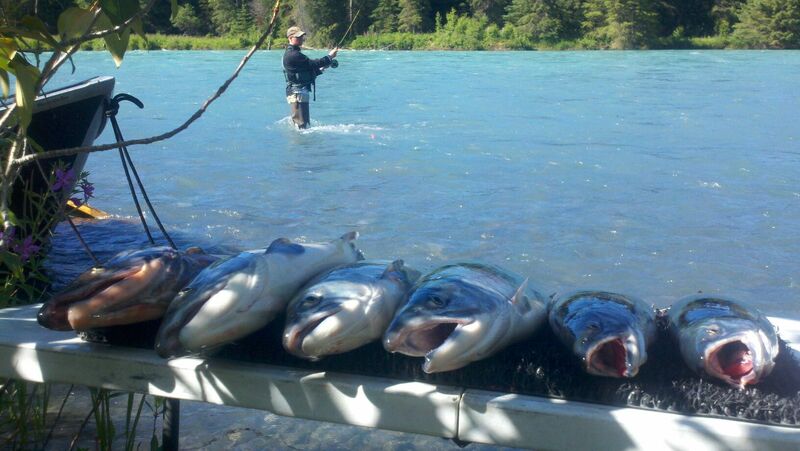 This entry was posted in River Report and tagged Alaska, Cooper Landing, Fish, Fly fishing, Kenai, kenai river, Salmon, Sockeye, Sockeye Salmon on July 24, 2013 by jenharpe. We are sitting at just a few hundred shy of a million Sockeye Salmon in the Kenai River as of yesterday. Add what will have been counted by the end of today and we are looking at not only over a million Sockeye in the drainage but also at some good odds out there! The middle has been productive and with the bag limit at 6 per person/day and the upper, though not teeming with the numbers that are soon to come the Upper Kenai has also been very productive. From Skilak into the upper Kenai we are still looking at limits of 3 per person/day so please be aware of the differences in regulation while out there. If getting out on the river and catching yourself some fresh Alaskan Sockeye Salmon is what you desire, now is the time to do it! 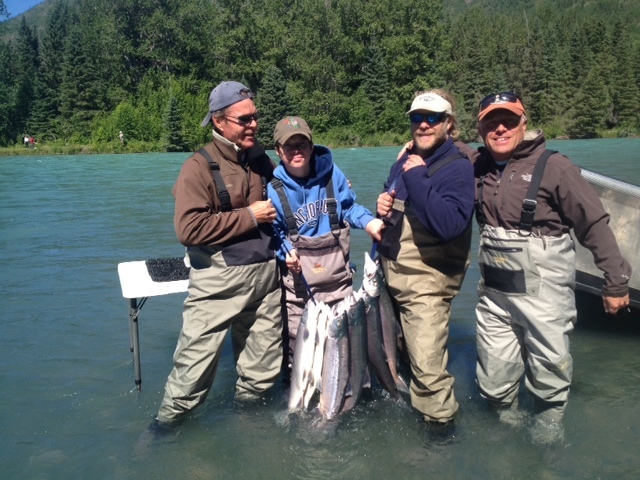 Glen from Texas enjoying his day on the Kenai River with a days catch of Sockeye Salmon caught on a fly rod. 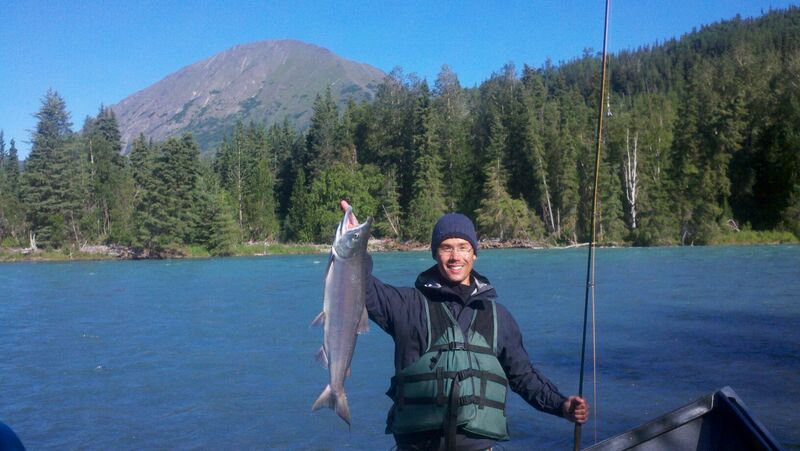 This entry was posted in River Report and tagged Alaska, Fish, Kenai, kenai river, rainbow trout, Sockeye, Sockeye Salmon, upper kenai on July 21, 2013 by jenharpe. Enter your email address to subscribe and receive fishing reports by email.